Rombout Fire Chief Jeff Marino, on the left, gives the oath of office to the newly elected Firematic officers. (L to R) Captain Wesley Hall, 1st Lieutenant Engine Operations Robert Schulze, 1st Lieutenant Ladder Operations Michael Darcy, 2nd Lieutenant John Webb and 2nd Lieutenant Marc Breimer. Also sworn in, but not shown are 1st Assistant Chief John Lucariello, 2nd Assistant Chief Charles Kuehner, Medical Officer Brian Allison, Safety Officer Paul Tompkins. For the Fire Police, Captain Charles Guarino and Fire Police Lieutenant Daniel Silvestri Sr. The 100% volunteer, Rombout Fire Company, protects most of the town of Fishkill and answers approximately 500 emergency calls each year. New volunteers are welcome to apply at the Fire Station on Route 52 near I-84 on Monday nights at 7:00pm. 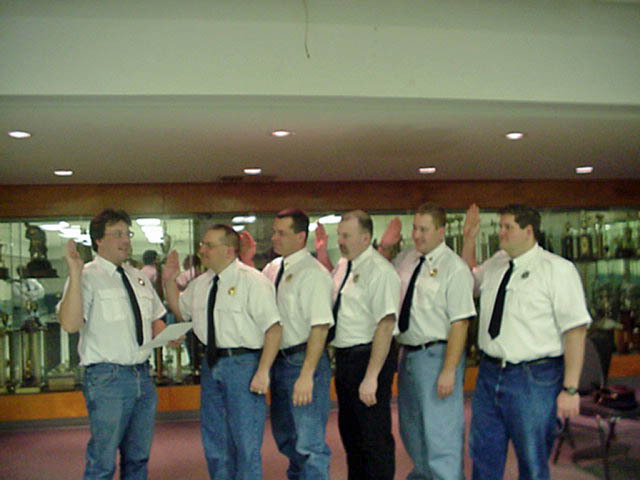 Congratulations to all the new Firematic officers who start serving their one-year terms on January 1, 2005.